: Reservations are not accepted at Elote Cafe, and diners often queue up well before opening in order to snag a table. 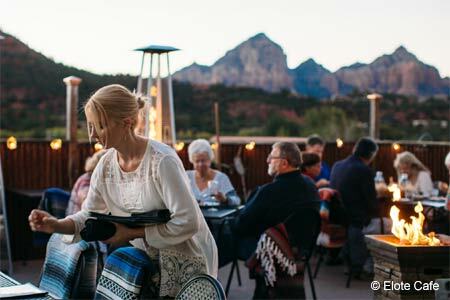 The patio, as well as part of the dining room, present fantastic views of Sedona's Red Rocks. Chef Jeff Smedstad serves cuisine inspired by more than two decades of travels through Mexico. Favorites like guacamole are found alongside more unique offerings such as smoked pork cheeks served with cascabel chile sauce, corn cake and buttermilk cumin drizzle. Other main courses might include lamb adobo, carnitas and buffalo short ribs braised in traditional mole poblano. The restaurant also serves its signature elote, a fire-roasted corn served with spicy mayonnaise, lime and cotija cheese. After dinner, indulge in desserts like sweet potato flan or homemade ice cream. As for beverages, Elote features tasting flights of Mexican tequilas, plus local and Mexican beers and several variations on the margarita.